The Men's Wallets were designed to make full use of the large printing plate of the Ultimaker 2. 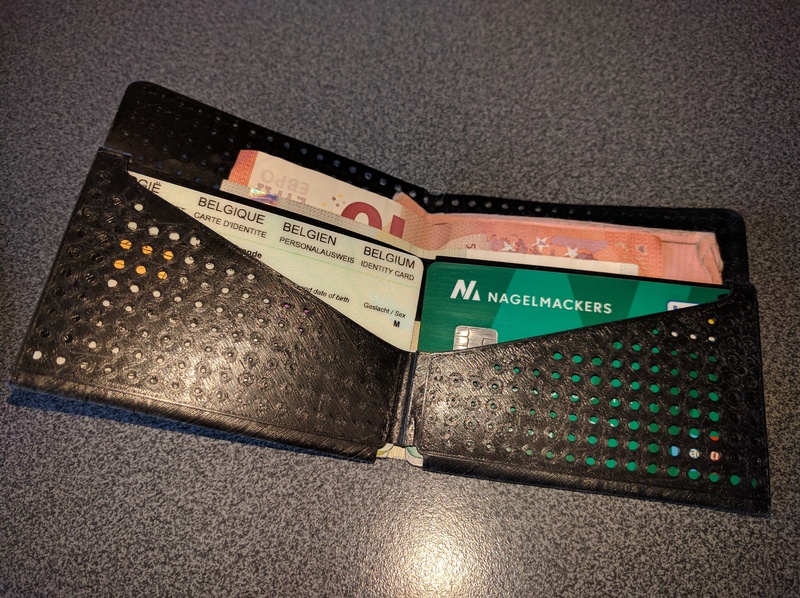 Unfortunately due to the size constraints, these wallets are not printable on an Ultimaker Original. Came out very well. It was the first flex PLA design I printed on the UM2 extended+. I like the blank designs a lot. It was not very clear for me where I had to glue the tabs. The explanation on instructables helped, but the image was not very clear. I tried to customize your template per the instructions using Tinkercad. All seemed ok until i started to print. After the 1st layer got laid down everything failed. After analyzing the Tinkercad model and the Cura model, Tinkercad created a bunch of voids where it should have been solid, and basically did not read the .stl file at all, totally messed it up. Going to have to try other software. And 2) if you print directly on glass bed you will get a super shiny surface finish, which personally I think looks funny on a wallet as it makes it look like a plastic toy. Thanks I will try the .8mm nozzle. I have a heated bed that should be good I hope. Can put some glue down as I don't have any tape. ok fixed that issue, due you think its safe to print with an .8 nozzle or .6 nozzle to brink the time to print down to less that 7 hours? Hi @ampirical2016 is the view just grey in normal view? Perhaps you forgot to turn off skirt. Because the design maximises the built plate we turn off skirt to do this. I would highly recommend your bottom an top thicknesses at least 3x your resolution. I usually print at 100% infill as well. I look the layers view mode and there is nothing. What am i missing?